Our Luna range is welcoming the addition of our Luna Bed Side Table. As all other items in our ‘By MuBu’ range of furniture, the Luna side table is made by us in Melbourne, with great attention to details and quality. A simple yet striking design, the Luna side table will sit perfectly next to any of the beds making up our MuBu Bed Range. 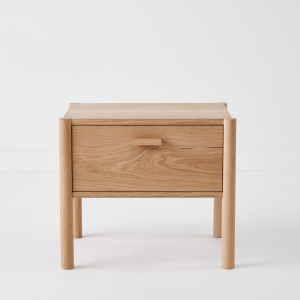 The Luna bed side table comes in a natural clear finish and in a choice for timbers: Tassie Oak or American White Oak and upon request American White Ash and Toasted Oak. Please note due to the nature of timber products will differ in appearance.